I hope you all had a great weekend. We celebrated my parents 40th wedding anniversary on Saturday at our house. We had a great time, even though it rained. I had spent all week fixing up our dilapidated backyard, only to have to move everyone inside about thirty minutes into the party. My dad got all sentimental talking about my mom. It was a great night. I'll be posting pictures of my backyard later this week. I got the house cleaned up yesterday morning, but all the tables and chairs are still all set up in the backyard. Ugh. Here's a cute project that I worked on for my sister's apartment. 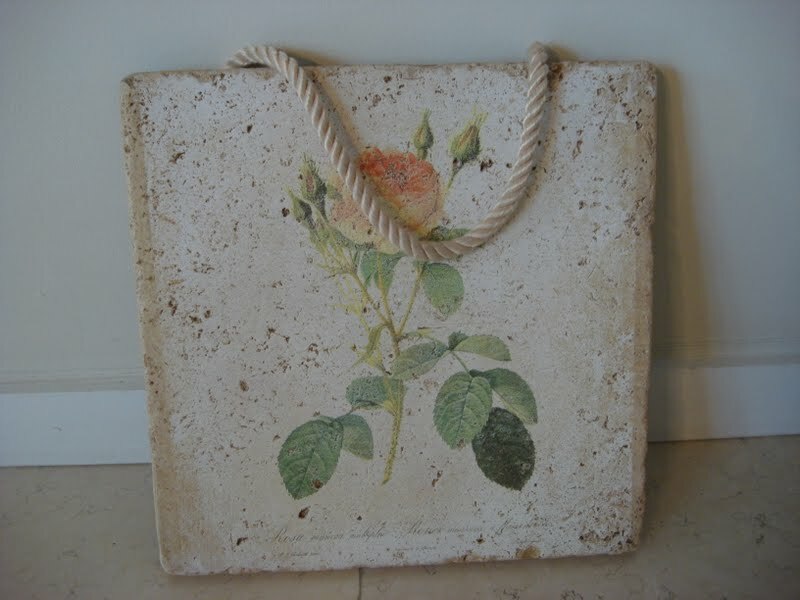 I found this flower foam tile rose painting at Goodwill for $2.00. 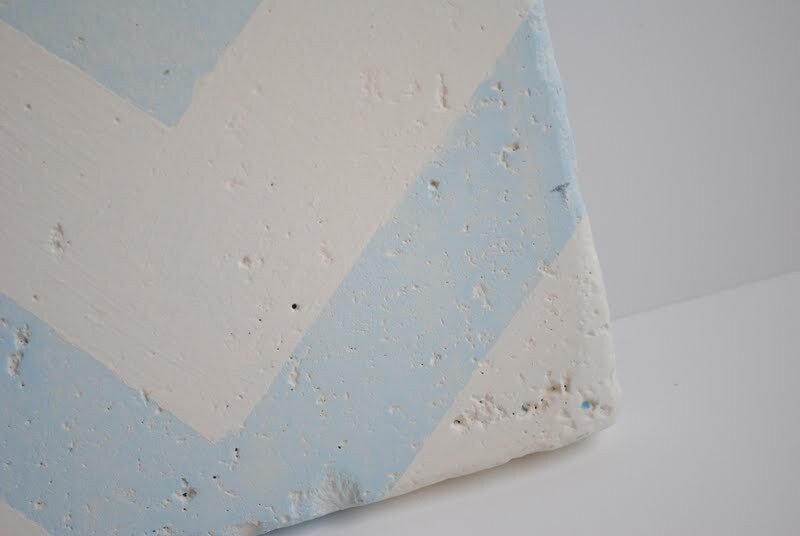 I knew the print wasn't for me, but there was something about the texture of the tile that caught my eye. I wanted to soften it up a bit so I used the same technique that I used for my cherry blossoms painting. I filled a cup with about two fingers of water and then I dipped the tip of a paintbrush in the can of paint and then dipped it in the water and mixed it up. I then brushed the tile over and over. It's a weird finish at first, kind of bubbly, but just keep brushing and brushing. Eventually it evens out and softens the color on the tile. 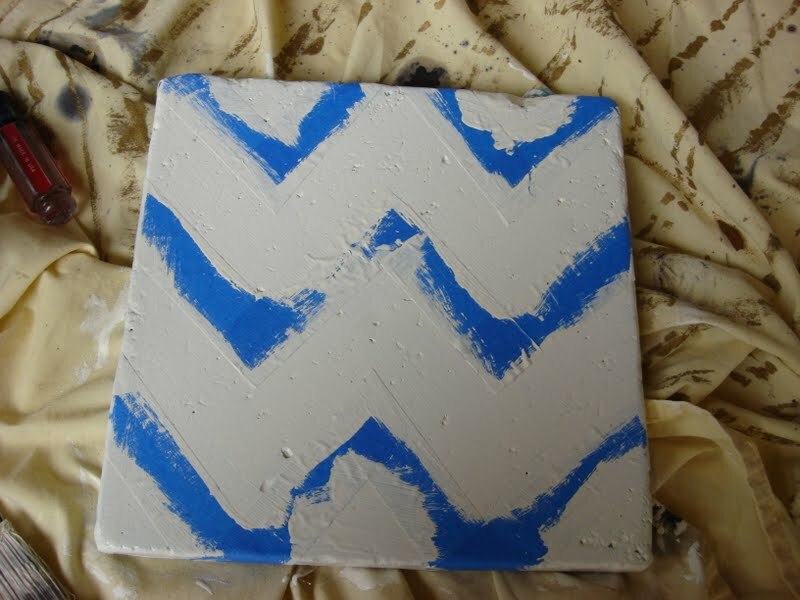 Then I taped a zig zag pattern to the tile. I tried to do my best measuring it out. 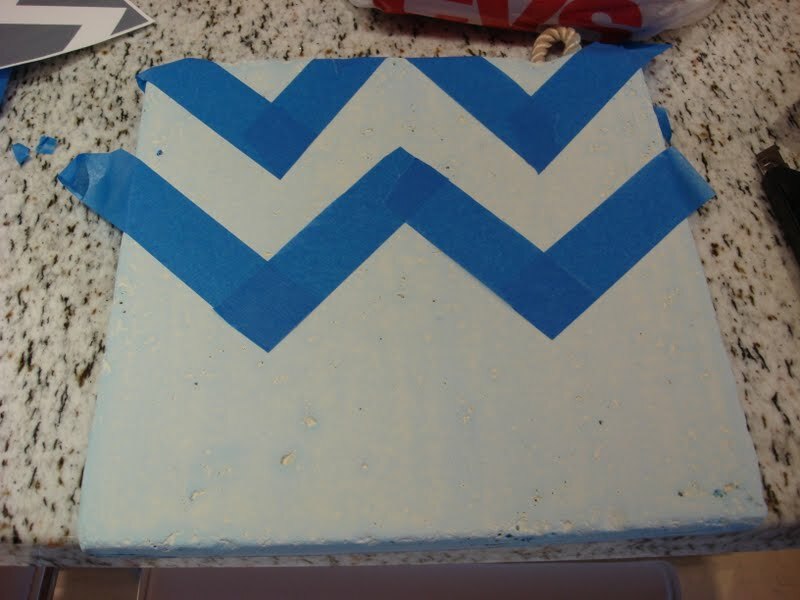 For the final step in painting, I used Annie Sloan's Chalk paint (not watered down) to fill in the spaces between the tape. I then removed the rope and added a pretty satin ribbon. I hot glued it to the back of the tile and here it is. 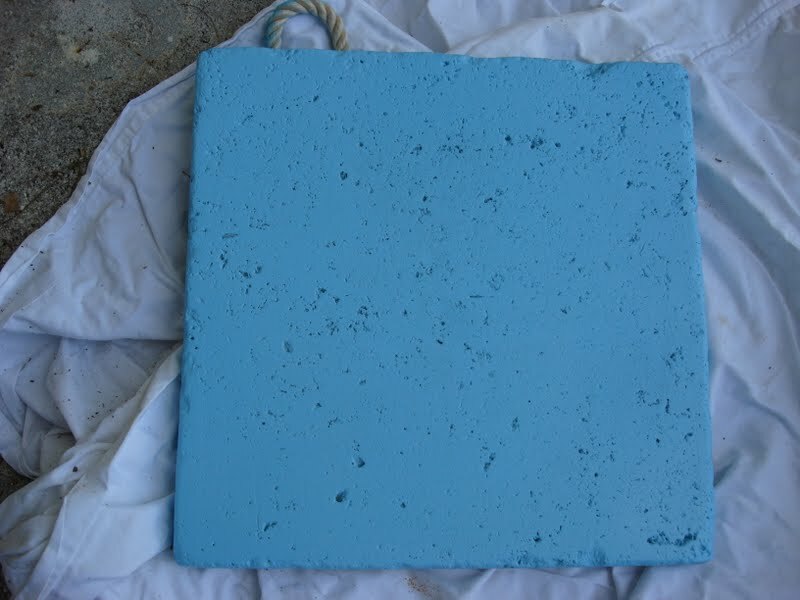 Here you can see detail of the tile and the softness of the blue after using the watered down chalk paint. I made this for my sister and it will be sitting by her new chevron chairs and chandelier. I'm thinking it might work great as a pin board. I'm so excited about setting up her apartment. I've been working on projects for what seems like months. I think the painters will be going this week and then we are ready to get everything in there. We will be heading to the beach today (weather permitting), I LOVE summer. I'll be linking up to these linky parties. This is such a cute idea! 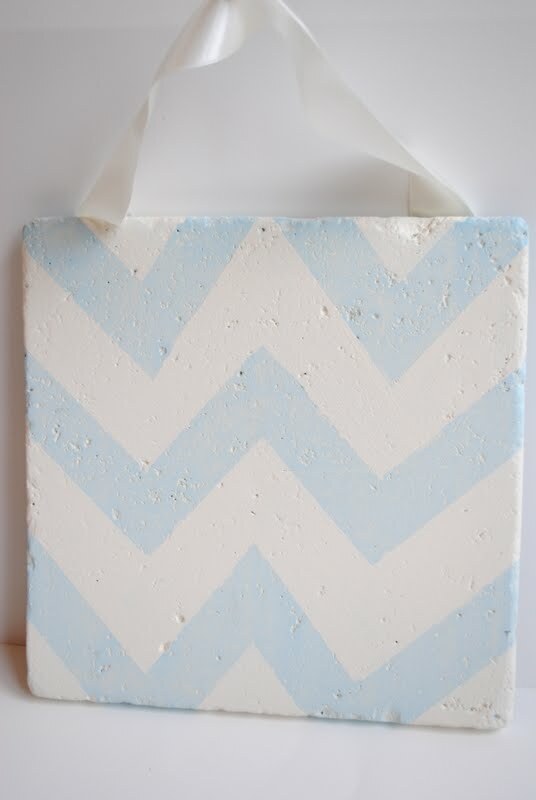 I am loving chevron print right now! Great job and cute blog! I love that you call this a zig zag! It makes me feel less alone with everyone talking about "chevron" recently. I can't wait to see a picture of your sister's place w/ all the goodies you have done for her. I am soo jealous. Your sister is so lucky. You're great with paint. I don't know that I'm ready to start watering things down, but I may give it try at some point since you make it seem doable. Found you over at The Mustard Ceiling. Added a link to you in my blogroll at www.imagesouthfineart.com. I'm coming over from The Mustard Ceiling's link-up blog party - you were the blog linked before mine. I love the update you made to this tile. And I love doing some thrifting - it's so much fun. Your parent's party sounds like it was a great time. It sounds like you worked hard outside to prep for the party - my daughter's 1st birthday is coming up soon so we're busy getting ready for that. My post tomorrow is about curb appeal and outdoors stuff. Glad I found your blog. Great post, such a simple yet effective project. I am visiting from The Mustard Ceiling; will add your blog to my list. Cute project. Lovin' the soft color palette of blue and cream you used. Can't wait to see your sister's apartment. Thanks for linking up to mix and mingle this week. Very cute project :) I love blue. The texture of this makes it look like tumbled marble. You'd never guess it was foam! BYW...love your blog header! Very cute! It looks so much better! 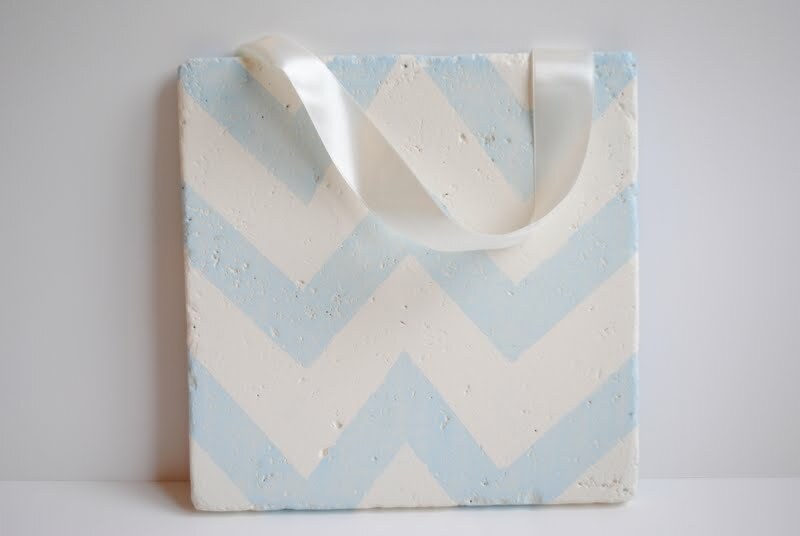 Love the chevron! Love the redo on this! Beautiful. Stopping by from Homemaker on a Dime. Be-a-utiful....as always! You need to come over to my house and just work your magic. Thank for linking this up to my party! I totally want to steal this idea! So stinkin' cute!